In this video (an excerpt from an EBB continuing education class), you will learn why black women and babies in America are dying at higher rates in childbirth than white women. This lecture is part of a larger continuing education course on evidence based care called “How to Help Families get Evidence Based Care,” . March of Dimes summary of racial disparity statistics. Most recent maternal mortality rates in the U.S.
Nuru Jeter (2009). “It’s the skin you’re in.” Matern Child Health 13(1): 29-39. Willis et al. (2014). “Conquering racial disparities in perinatal outcomes.” Clin Perinatol 41: 847-75. White Privilege: Unpacking the invisible knapsack, by Peggy McIntosh. “How Does Race Impact Childbirth Outcomes?” published by Georgetown University. 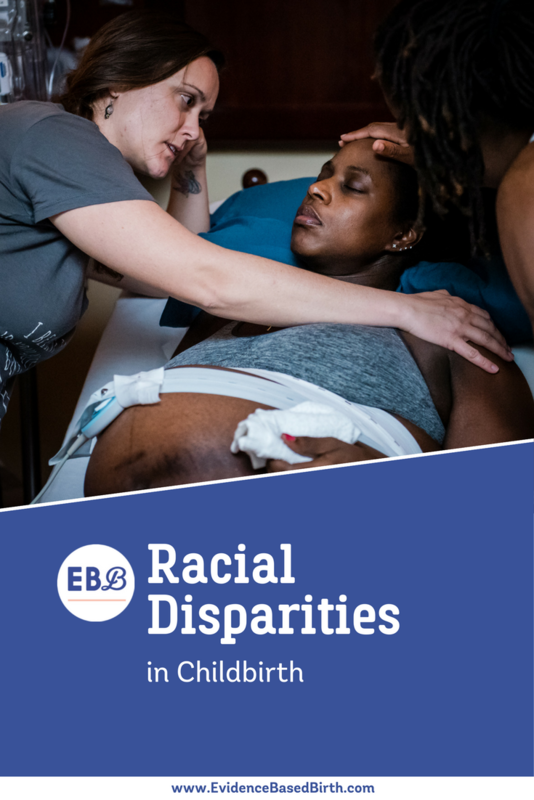 This resource provides insights into the alarming disparities surrounding race and childbirth outcomes, explores possible reasons why women of color experience higher-risk pregnancies, and discusses the importance of diversity in healthcare. It also contains an infographic illustrating how childbirth outcomes vary between races. Before we move any further in talking about birth planning, I want to talk about vulnerable populations and racism. By the end of this section, you’ll be able to describe disparities and birth outcomes for women of color and other vulnerable populations, and discuss systemic racism and oppression and the effects on birthing women of color. I think it’s really important for you to understand the racial disparities and child birth outcomes both of the mother and for the baby. Black women in the United States are four times more likely to die in childbirth. The death maternal mortality rate for black women is about 41 per 100,000 versus 11 per 100,000 in white women. They’re also more likely to have a preterm birth. Their preterm birth rate is 16% versus 10%, and they’re twice as likely to have a low birth weight infant, 13% versus 7% in white women. They’re also more than twice as likely to lose a baby in stillbirth and they’re more than twice as likely to experience the death of their infant in the first year of life. The death rate for black babies is 11 and a half per 1,000 versus five out of a 1,000 in white women. That means one out of a 100 black babies will die in the first year of life. These differences persist even after controlling for other risk factors. For example, if you are a black woman who is educated at the graduate level and of a high socioeconomic status, your risk between preterm birth, low birth weight infant, maternal mortality, loss of baby in stillbirth and infant mortality is still higher than that of a poor white woman with less than a high school education. Now there are similar trends for other ethnic minorities in the United States, although not as drastic as we see with black women. They have higher rates than white women of these things, but the rates are not as high as with black women. This brings us to the question of why is this. Well, research has shown that we know it’s not race at the genetic level. It’s not because their ancestors came from Africa. They’ve been able to do studies to show that this is not the case. It’s something that is happening in our culture in the United States that’s causing this. It’s not education level. It’s not the presence or absence of prenatal care. It’s not socioeconomic status. What is the cause if it’s none of these things? Well, researchers have basically come to the conclusion that the cause of the increased maternal fetal and infant mortality is racism and chronic oppression. There have been multiple studies on this issue. There’s some really interesting studies about the chronic stress from racism and how it’s physiologically stresses women. They’ve done studies and laboratories where they’ll take black women, and they’ll measure her blood pressure and other physiological measures, and then expose her to a racist stressor or stimuli. The more her blood pressure reacts and the more physiological reaction she has to that stressor in the laboratory, much more likely to have a preterm birth. This chronic stress leads to physiological stress on her body. There’s also a transgenerational effect and the effective epigenetics. Epigenetics is the study of changes in people and organisms that’s caused by the modification of how your genes are expressed. You’re not altering the genetic code itself. It’s not the genetic code itself that leads to these poor outcomes. It’s how the genes are expressed and this is modified through the environment. Now research has shown that a black grandmother’s birthplace and the life stress she experiences affects three generations. It affects, so let’s go back in time and imagine that black grandmother when she was pregnant. 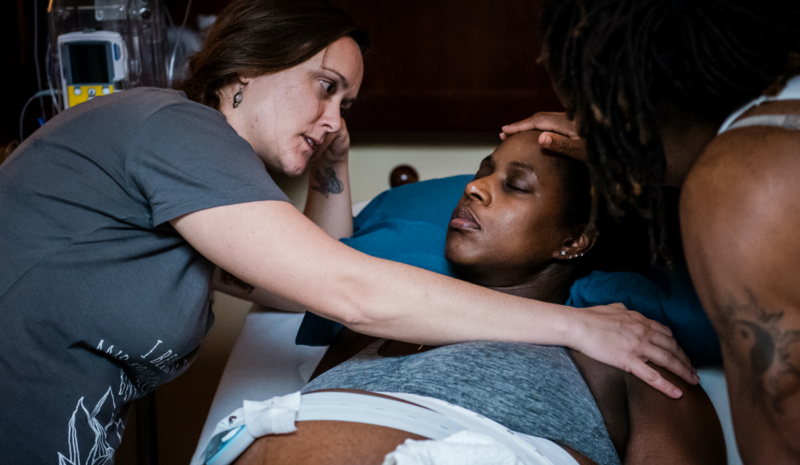 When she was pregnant and she was experiencing racism and both institutionalized racism, direct racism, she was experiencing those physiological stressors and at the time she was pregnant, so her stress is affecting her baby. That grandmother’s birthplace in life stress effects goes on to affect three generations; her own, her daughter’s, and her granddaughter’s. When we look at the historical context in the United States, African Americans have only been considering voting citizens for about 60 years and even after that time, they were facing considerable racism and they still do today. This historical context has a deep impact on birth outcomes of today. When we realize that for more than 350 years, black Americans were enslaved in very dehumanizing conditions, and you don’t just overcome that background in a couple of generations that this historical context of racism and how it has affected and their health continues on to affect birth outcomes today. There is a really interesting study that I will link to below. It’s a qualitative study where they did focus groups with 40 black women of childbearing age between 2004 and 2005. It really revealed the importance of their childhood experiences. They said that they experienced racism throughout their life and their first experience with racism was recalled vividly and with great emotion. Women were telling the stories that the first time they realized that they were different or that people treated them differently, and they were very emotional when they talked about that experience, which happened during childhood. They talked about the enduring impact of the racism they experienced when they were children. Racism happened in many settings and it happened between people. It happened in institutions and it was also internalized. In schools, they said they had to work harder with less support to prove themselves. For their own children being in school, teachers were surprised when their children did well and shopping in stores was a very frequent place where they experienced racism. Just going out to the grocery store would lead to that stressor of racism. They were “followed in stores, ignored by clerks and treated disrespectfully or with suspicion or disdain.” Most of the women in the study said that they think about their race or racism daily and they took conscious efforts to prepare themselves and protect themselves from racist attitudes or behaviors. They continue to experience direct and vicarious racism. Direct racism was them, themselves, experiencing racist behaviors and vicariously through their children. For many of the women in the study, the greatest impact of racism was stress for their own children. They felt deep concern and anxiety about their children having to face a life of racism as well. Racism led to physical symptoms. They said when they experienced direct and vicarious racism, they would feel sick, they would have headaches, they would get stomachaches, and they would even start shaking. You can only imagine during pregnancy or leading up to pregnancy the effect that this could have on a woman’s health and on her pregnancy itself and her baby. Now I want you to think back to the pillars of oppression and systemic problems in maternity care and think about how this comes into even greater play for women and families of color. Not only are they facing the maternity care system hierarchy which is an oppressive system in and of itself, but they’re also facing the racist oppressive system. They are facing what it means to be a woman, what it means to be a black woman, and what it means to be a black woman in the maternity care system. Researchers have said that when you face multiple hierarchical oppressive systems that this is called intersectionality, that these oppressive symptoms layer on top of one another and so you’re not only dealing with on, but you’re dealing with all three, and that can lead to cumulative and synergistic effects. This means that these women have multiple wounds to heal and they have multiple oppressive factors that they have to overcome. It’s critical that families of color receive respectful evidence based care when you consider that they’re already at a great disadvantage historically with that transgenerational effect and epigenetics. It’s just super critical that they get evidence-based care, but it’s even harder for them to get it because they’re facing multiple oppressive systems. When it comes to education and educating families of color, unfortunately first time mothers who are persons of color are the ones who are the least likely to take a childbirth education class. Sixty-one percent of first time mothers who are white take a childbirth education class. Only 58% of black first-time mothers and 53% of Hispanic women who are first time mothers. Mothers on Medicaid are the least likely to take a class. Only about half of first-time mothers on Medicaid take a childbirth education class compared to 67% of first time mothers with private insurance. There are other vulnerable populations as well that need access to education and evidence-based care and may face other obstacles. Indigenous populations, women who are Native American, women who are refugees, women who don’t speak the primary language wherever you live. These women often face higher rates of maternal and infant mortality, but they are also the least likely to get education and get support that they need. This is a problem that we are facing. One more note is that I wanted to talk about white privilege and there’s a really great article, a free PDF that I will post below called unpacking the invisible knapsack. It lists 50 incidences where white privilege works against people of color in where it’s pretty universal in that your skin color if you are black works against you. These are 50 issues that are directly tied only to your skin color and not your class religion or ethnic status or citizenship or any of those things. I think it’s important if you have white privilege to recognize it, to talk about it, to talk about how it’s not right that we have this oppressive system, and to work to be an ally and raise awareness. It’s really important, and I will be the first to admit that I have white privilege and I want use that to be an ally and work towards changing the system and raising awareness, but at the same time, there are days when I don’t work as hard as I should to be an ally and that is white privilege, the fact that I don’t have to work at it every day. If you are a person of color, you don’t have a choice, you have to work on it every day because your women in your social circle are dying and babies are dying. It’s important I think if you have a white privilege to recognize it and try to over comment as much as you can and help work together with our sisters to make change. As we move on, one of the reasons I put this in this module is because in module five, we’re talking about birth planning, we’re talking about what the women can do, what the people who are pregnant can do to be proactive. We need to think about this even more with families of color, how do they need to be even further supported or further educated. As I talked about birth planning, what are the effects of birth planning for a family of color and what pitfalls might they face even more so than a white family. We also need to think about how we can provide families of color with specific tools and resources so that they can become empowered, and think about what we can do at the macro level and at the micro level. I’d like you to stop and love for you to comment on what you’ve learned from this lecture and what you can do at the macro level or at the micro level with individual families to help support families of color and help decrease these racial disparities.